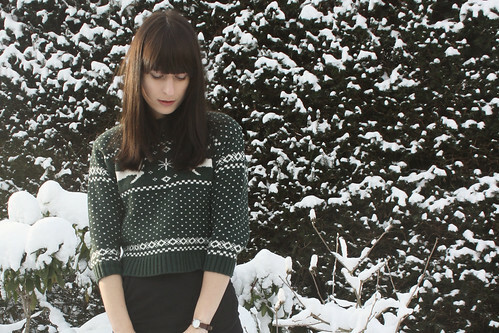 Vintage sweater // H&M skirt. I've been sitting inside watching Christmas movies and eating tons of cookies and other yummy things. Unfortunately Daniel and I won't be spending Christmas together. He had to fly back to his family because his father is in the hospital. He seems to be okay now. I'm gonna fly on the 27th to spend a couple of days there. As you can see, the color of my hair lightened up a lot after washing it a couple of times. I really like the color now. As for the length; aw well, at least it looks healthy. I guess you were all right: I just needed some time to get used to it. Hope you are all enjoying Christmas holidays and that the snow isn't ruining too many plans. I know that (at least here in Europe) a lot of people had to cancel their holiday plans because there are hardly any planes or trains going. I love your jumper! It'so cute and christmasy! You hair is looking fab, glad you are getting used to it. Hope your boyfriend's dad is ok. I'm not spending this xmas with my boy either which makes me sad :( Hope you wonderful few days though. I love the jumper, it's so perfect! Lovely outfit, pictures and sweater. p.s. check out the giveaway on my blog ! This is really beautiful!! Lovely!! Wat een leuke outfit! Sneeuw is mooi, maar inderdaad wel vervelend! this sweater is too cute! I love your vintage sweater so sweet. Good to hear your boyfriend's father is doing okay. Safe travels and happy holidays! Hope everything is alright with your bf's father! Good to hear he is doing better. I know you said you were devastated by your hair cut but I seriously think it is beautiful! Maybe you'll grow to love it, but for me, it's love at first sight. The snow in your last two posts looks beautiful, although I can't even imagine cold weather at this point - it's so hot here! Your sweater is sweet, it reminds me of what my Grandmother would have knitted me! Love you're outfit! Great sweater! Get well soon Daniels dad. I hope you have a great Christmas, it's so snowy here too, my family managed to travel down to spend christmas here, I was really scared they would get stuck, we're not used to all this snow! I love the green sweater, so festive! 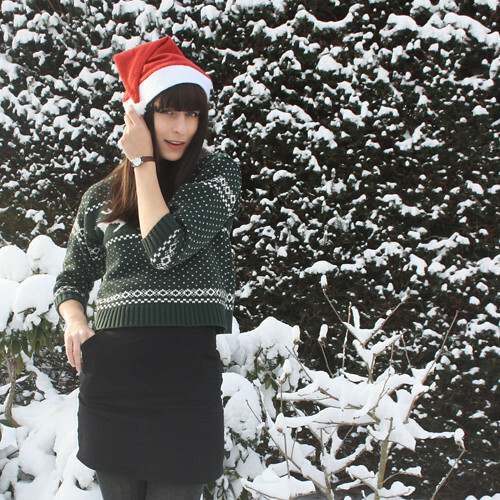 Love your sweater, perfect for Christmas time !